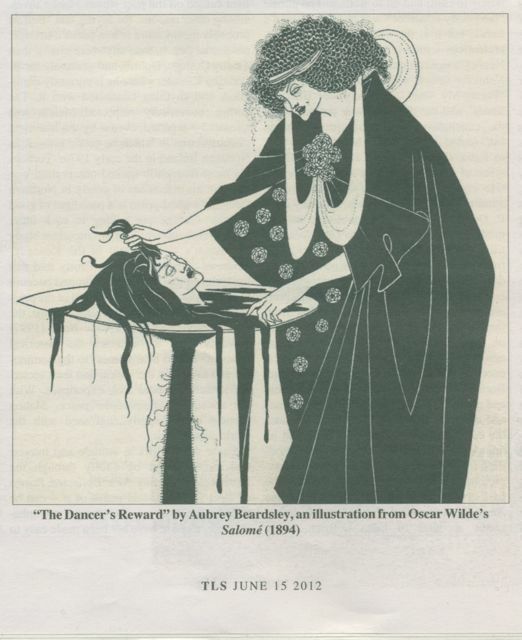 A review in this week’s TLS reminds me of something I had perhaps forgotten, unless it’s something I never knew, and that is that Oscar Wilde’s tragedy-in-one-act Salome was first written en français. It was then translated into English by Wilde’s lover, Alfred Douglas, but the latter’s translation was apparently so incompetent that Wilde had to rework it himself. This, it seems, is why Douglas’s name was removed from the title page of the English text and only mentioned in Wilde’s dedication for the play. It’s uncertain then whether the English text really should in fact be considered a translation. In any case, if you want a new English translation, then you can read Joseph Donohue’s text, published by the University of Virginia Press. The review of Donohue’s translation in this week’s TLS is by Joseph Bristow. This reproduction of one of Aubrey Beardsley’s drawings is from the review in this week’s TLS.